Aloha to all of our EWCA chapters and mahalo to the chapters that responded to the call for quarterly reports. A big mahalo also to the chapters that are supporting the EWC Foundation’s Student Scholarship fundraising goal. 1) Arizona (Tomi Johnston) 2) Brisbane and Virtual Australia (Iraphne Childs 3) Canada (Jonathan Jacobs) 4) Chennai (P. Subramaniyam for Sonna Belliappa) 5) Hyderabad (Nageswara Rao) 6) Kansai (Seiko Furuhashi) 7) Karachi (Aziz Husain) 8 ) Myanmar (U Maung Maung) 9) Nepal (Nirendra Maske for Shankar Sharma) 10) Papua New Guinea (Solomon Kantha and 11) Singapore (Seok-Hoon Seng). Congratulations and a big welcome to Tomi Johnston who now serves as the Chapter Leader of Arizona after the resignation of Michelle Marion as Chapter Leader on September 2, 2011. However, Michelle Marion will continue her service to a) the EWCA Board and b) the EWCA Student Scholarship Endowment Fund. Mahalo to the Arizona Chapter for sending out to their EWC alumni the EWCA Student Scholarship Endowment Fund Appeal letters in early September of this year. Iraphne Childs’ report updated the list of officers as follows: President, Contact Person and Chapter Website Coordinator: Dr. Iraphne Childs; Secretary: Karen Nunan and Treasurer: Peter Nunan. Likewise, the Chapter forwarded a list of current members (18) and their email addresses. Their newest member, John Beruldsen of Adelaide, was an alumni recruited as a result of the 2010 reunion. The Chapter wishes to thank Noreen Tanouye for providing their group with contact details on EWC participants who have completed their respective programs. For the quarter, the following events occurred: 1) August 5: Members attended a dinner at a Tibetan restaurant in honor of Indira Rana Magar, Director of Prisoners Assistance Nepal Children’s Homes. One student in a pre-nursing program of Magar’s school has been sponsored by the Chapter. 2) August 28: The Chapter donated educational books to a school in Kathmandu via one of their teachers who was on a home visit in Brisbane. 3) The Nepalese Australian Friendship Association (NAFA), an association that provides tax deductible receipts, has been the channel for the community service projects of the Chapter. Currently, the Chapter supports two economically disadvantaged student recipients in Nepal. The Chapter intends to continue their support for the students as long as they continue to study. 4) Members of the Chapter continue to work with the Australian Red Cross after the Queensland devastating floods in January, 2010. 5) Lastly, Chapter members are encouraged to support the EWC with financial contributions individually. The Chapter has been idle over the summer months. However, Chapter Leader Jonathan Jacobs is looking forward to re-energizing their efforts in the near future. Chapter VP P. Subramaniyam reported that the quarter period has been marked by planning activities for the following quarters. There was a change in the US Consul General, the patron of the Chapter. A committee meeting of principal office bearers was held to discuss suitable programs for a formal function inviting the new US Consul General. The Chapter also is pursuing further activities in the areas of environment and public health. For this quarter, the Chapter is reporting the continuation of activities relating to the conducting of medical camps with the assistance of medical fraternities and pharmaceutical companies, as well as the cooperation of school children and the villagers. Seiko Furuhasi’s quarterly report included the current listing of their officers. With approximately thirty people participating in activities, the following are the leaders of the Chapter: President, Chapter Leader and Contact Person: Seiko Furuhashi; Vice President and Communication Liason: Kiyoshi Hamano; Advisers: Tomohide Ashida, Mineo Suenobu and Eiji Saito; Other Officers, Board, Committee Members: Nobukazu Tanii, Hayato Yamanaka, Fumiteru Nitta, Yumiko Okamoto and Hideaki Sakamoto. At the Board meeting of the Chapter held on August 5th, the following were discussed: 1) For alumni who have not been active for a length of time, the Board discussed the policy relating to the keeping of membership and the keeping of a mailing list. 2) The newest Board member, Hideaki Sakamoto, accepted the invitation to be part of the Board. Since he is a Staff Writer for the Sankei Shinbun Newspaper, he will provide further diversity to a largely academic oriented Board list. 3) The UH Alumni Association and the EWCA Kansai groups are hosting a Kansai Sake Brewery Walking Tour on November 13, 2011.This tour will include visits to the Kinshi Masamune Brewery, Gekkeikan Okura Sake Museum, wine tasting, shopping and dinner at a local restaurant. 4) Chapter President Seiko Furuhashi was in New Zealand to attend a conference held in Wellington from Aug 26 to the 28th. She likewise visited Waikato University and met with local officials and EWC related individuals. We thank Aziz Husain for trying his best efforts to reactivate the Karachi Chapter. The Karachi Chapter will notify the Executive Board when some concrete programs are in place. Aziz has reached out to two alumni, Kamran Khan and Syed Hassan Nawab, hoping to get their active commitment towards reactivating the Chapter. He will try to contact the two most recent alumni names sent by the Alumni Office to see if they would like to take major responsibility in the reactivation effort. He is hoping that he can call a general meeting of old and new alumni before he leaves the country between the 22nd of October to the 1st week of November. He assures the Board that he will continue his reactivation attempts when he returns. After many years of dedicated service and leadership, Myanmar Chapter President U Maung Maung is stepping down and will continue his role as Advisor to the Chapter. The following are the current officials of the Myanmar Chapter: President: U Thien Lwin; Vice President: U Soe Win; Secretary: Cho Cho Yee; Advisor: U Maung Maung. At this October 9th meeting ( which coincided with the 6th Anniversary of the Chapter) held at Dolphin Restaurant, Yangon and attended by ten of its members, the following activities were also identified in the quarterly report. 1) The Chapter welcomed a returning EWC alumni, Dr. Kyaw Lin Tun, after receiving his MPH at UH. 2) Recognition was made of the personal subsidy that U Maung Maung donated to the Chapter during his leadership tenure, to make sure that the Chapter proceeds smoothly. 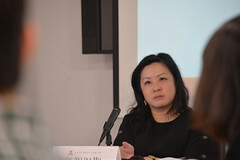 The newly elected Secretary, Cho Cho Yee, volunteered personal monetary contribution for the Chapter’s running expense and hopes to initiate a project to look for potential donors to keep the Chapter financially stable. 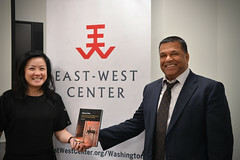 3) Lastly, the idea of establishing an endowment fund was mentioned at the meeting, the continuity of sending gifts in kind to support the EWCAA Fundraising was affirmed, and U Maung Maung encouraged the Chapter to continue helping the EWCAA’s Student Fundraising goal at the breakfast meeting. Mahalo to the Chapter for their support. For this quarter, the Chapter’s activities were limited. 1) September 11-12, 2011: The Chapter took part in the 10th Commemoration Ceremony at the Phora compound of the US Embassy. 2) The EWC alumni took part in the reception welcoming the 2011-2012 Fulbright scholars and students organized by USEF at the Commission Auditorium Gyaneshwar on September 12. 3) Towards the end of October, the Chapter is planning a potluck picnic. The Chapter engaged in the following activities for this quarter: 1) Two alumni members, Lucas Manduru and Evelyn Pusal (at the recommendation of Chapter Leader Solomon Kantha), attended a social event on Oct. 17th at the residence of US Ambassador to PNG, Teddy Taylor. The occasion was a visit by Mr. Kurt Campbell, Asst. Sec. of State, Bureau of East Asian and Pacific Affairs. 2) Chapter members participated in the July 4th US independence festivity at the residence of the US Ambassador in Port Moresby. Also in July, Chapter members attended a Concert held at the US Embassy. 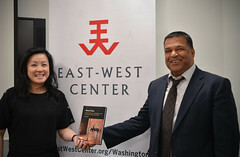 3) Lastly, Chapter Leader Kantha was responsible for the following: a) Widely distributed information on the 3 EWC Scholarships- US South Pacific Program. ADB Japanese Govt. Scholarship and EWC Graduate Fellowship Program. He likewise elaborated on living conditions, etc. in Hawaii. b) Briefed PNG artist Jeffrey Feeger who will be Artist in Residence at UH on Nov. 2010 on life/study at EWC and UH. c) Mr. Kantha, along with alumni Simon Kenehe, served on the following selection committees: Fulbright Scholarship and Humphrey Fellowship. Congratulations! The Chapter is reporting the following activity for this quarter. 1) The Chapter hopes to meet in November to discuss how the group can support the EWC Student Fundraising Goal. 2) On September 19-21, 2011, the Singapore Chapter hosted a dinner to welcome back EWCA grantee professional dancer Garrett Kam (from Bali) who gave a lecture demonstration at the Nanyang Academy of Fine Arts Symposium. The theme of the symposium: New Asian Imaginations: Researching the Arts in Southeast Asia. 3) Likewise, the Chapter supported the Symposium itself which was held in the Academy in downtown Singapore. This entry was posted in EWCA Chapters and tagged EWCA Arizona Chapter, EWCA Brisbane Chapter, EWCA Canada Chapter, EWCA Chennai Chapter, EWCA Hyderabad Chapter, EWCA Kansai Chapter, EWCA Karachi Chapter, EWCA Myanmar Chapter, EWCA Nepal Chapter, EWCA Papua New Guinea Chapter, EWCA Singapore Chapter. Bookmark the permalink.